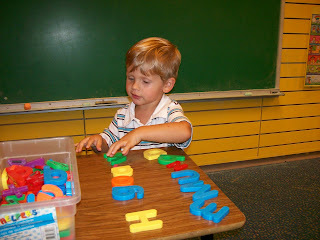 Dawson really enjoys playing with letters. We have about 10 letter puzzles, letter magnets, letters for the bathtub, etc. 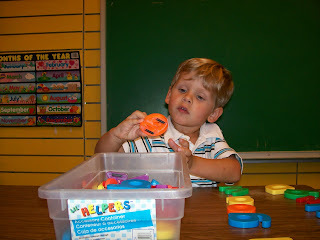 Here, he's playing with a big tub of letters at The Woodlands Children's Museum. He's known his letters and the sounds each makes for the past year, but he's recently begun to understand that if you put the letters together they make words. The other day at home, he put "g" and "o" together, looked at us and said, "spells go." And he recognizes many more words - cat, dog, cow, pig, bear, boat, tree, stop, enter, exit, dawson.